Reserve your spots soon as they are already filling up! @skihard the boss saw this opportunity and suggested seeing about a spot. Unfortunately we've already got plans that weekend, will come talk about Alberta hot-spots some other time. No worries dude! It's always a great weekend full of fun and learning. It fills up fast usually and this one is no different. Posted it this morning and we are 1/2 booked already! Where is the clinic located? Looks like there was a picture posted in your post @skihard but for whatever reason the pictures don't appear on my work computer. Can anyone share some details? @austinminer, Ski Texas south of Houston. Notice - we filled all spots for the clinic in a little over 24 hours. Kudos to Trent and the Ski Texas Phase ll residents as this clinic always fills up fast. If you'd like your name placed on the cancellation list please let me know. First on list is first replacement. As usual Trents coaching is top notch. Really productive sets this morning. Thanks Trent, Rod and Jim. Always a pleasure to see you Carl and thanks for coming down. And yes skiing with Trent is always insightful and a whole lot of fun! Jam packed full again today and can't wait to do it again in the future! Great set with solid advice. Great way to start the year! Thanks @TFIN and @skihard and all the rest that helped to make the clinic take shape! Thanks for putting this weekend together. Always enjoy skiing down at Ski Texas. Quick follow up report this morning - sorry yesterday was Monday and well that speaks enough for itself right there. Thank you again Trent for making this a great weekend. Very positive feedback from skiers who came and attended. Your attention to detail and delivery of coaching is something that everyone who attended mentioned to me either in the boat, on the dock, or in a follow up email. We had first time students who were learning how to cut the wakes properly to a veteran Big Dawg skier looking for that little bit of help at 39 off and deeper. Skiers - thank you all for coming & taking part in Trent's clinic and making this the success it always is. Without you it can't happen. Comment from someone new to the game on Sat afternoon "I can't believe how nice everyone is and even the great skiers take time and talk to the other guys!" Kudos to everyone, this is a great sport and that camaraderie is what helps drive newbies and people like me to get better. Boat drivers; Myself, Jim T, Jim M, & Kelvin. Lots of time spent in the heat and sun - great job! 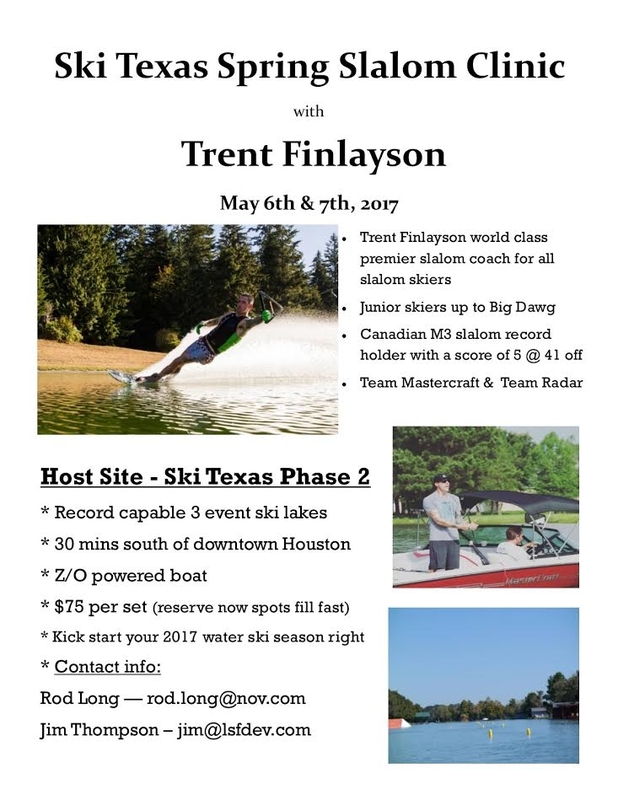 Ski Texas homeowners - Thank you for giving up the lakes and allowing all the skiers to come enjoy our site for the weekend. Without that approval this doesn't happen at all. Not sure why we are always so lucky but the weather was great again and I look forward to doing this again in the future. Thanks to everyone. Successful weekends like this past one make the hard work worth every minute! Can't wait to do it again! Until next time.........take what you learned from Trent this weekend and ski well friends!